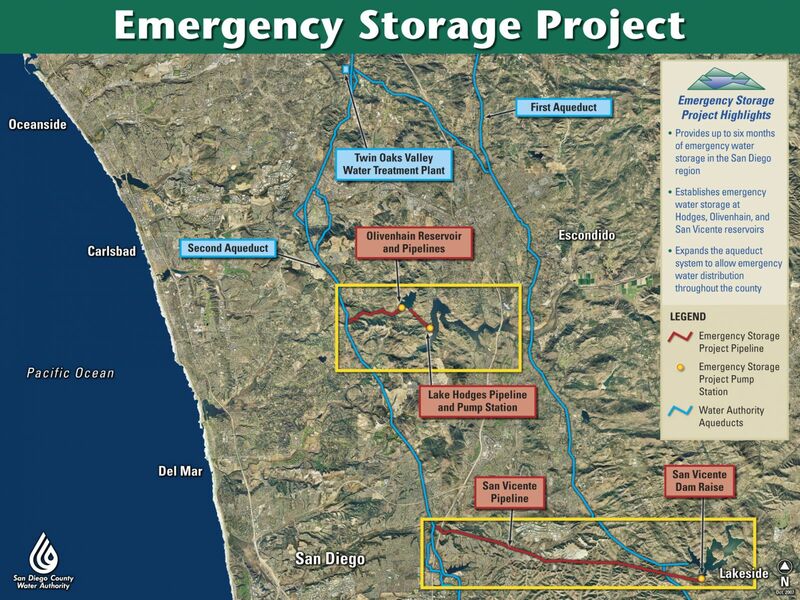 The Emergency & Carryover Storage Project is a system of reservoirs, interconnected pipelines and pumping stations designed to make water available to the San Diego region in the event of an interruption in imported water deliveries. Lake Hodges Projects connect the city of San Diego’s Hodges Reservoir, also called Lake Hodges, to the Water Authority’s Olivenhain Reservoir. The connection provides the ability to store 20,000 acre-feet of water in Hodges Reservoir for emergency use. Olivenhain Dam and Reservoir was the San Diego region’s first major new dam and reservoir in 50 years. Construction on the dam began in August 2000 and was complete in 2003. Olivenhain Reservoir has a storage capacity of 24,000 acre-feet of water. San Vicente Pipeline is an 11-mile, large-diameter pipeline that will operate with other Water Authority facilities to deliver water from San Vicente Reservoir to water agencies in the central and southern half of the county during emergencies. San Vicente Pumping Facilities will move up to 300 million gallons of water per day from San Vicente Reservoir through the San Vicente Pipeline to the Water Authority’s water delivery system in the event of a water supply emergency. San Vicente Dam Raise has increased the height of the dam by 117 feet to store an additional 157,000 acre-feet of water, more than doubling the capacity of San Vicente Reservoir. Working in Nature To compensate for the construction impacts from the Emergency & Carryover Storage Project, the Water Authority has funded the acquisition of nearly 600 acres of upland habitat areas and is creating or enhancing nearly 40 acres of wetland habitat, all located within San Diego County. The new water facilities that comprise the Emergency & Carryover Storage Project are being constructed over a 14-year period from 2000 through late 2014. For more information, please call the 24-hour toll-free project information line at (877) 682-9283, ext. 7001, or email espinfo@sdcwa.org. A representative from the project team will return your inquiry within one business day.